Stupid neck drama continues stupidly. Off to the specialist today, to hopefully receive good news and a rescue plan. In the meantime, enjoy these amazing photos of squirrels! There wasn’t quite so much armour-gazing on this trip. Previously I’ve collected some great photos from the Tower of London, the Royal Armoury at Leeds and the Metropolitan Museum in New York, all of which house some wonderful armour and attendant equipment. But there were some amazing pieces in the Wallace Collection, in London, notably the horse armour, as well as the Yorkshire Museum. Here are some of the astonishing pieces I saw … some captioned, some not, but all telling a fabulous story! It might seem funny, given that I’m not a particularly blingy person in daily life (not counting my growing collection of seriously cool ear-rings, which I added to with gusto while on the recent trip!) but when it comes to jewellery in museums I am hopelessly entranced. I think perhaps it’s a romantic fascination: I am endlessly intrigued by the fact that throughout history, without exception, people have found ways to adorn themselves. As I look at the pieces in the museum, and the photos, I find myself dreaming and wondering about the artisans who made each piece, and the women – and men – who wore them. Who were they? What happened to them as they wore these pieces? What happened ot the amazing artisans who created them? And how can I give them a sinister, fantastical twist? I acquired a fabulous book from the British Museum – ‘7,000 Years of Jewellery’ – which catalogues their collection. It’s magnificent. And so, I think, are the pieces featured in the photos below, from such diverse collections as the British Museum, the Victoria and Albert, the Museum of Decorative Arts and the Museum of the Middle Ages, both in Paris . Enjoy! Covet! And if you find yourself drooling a little … believe me, you aren’t alone! 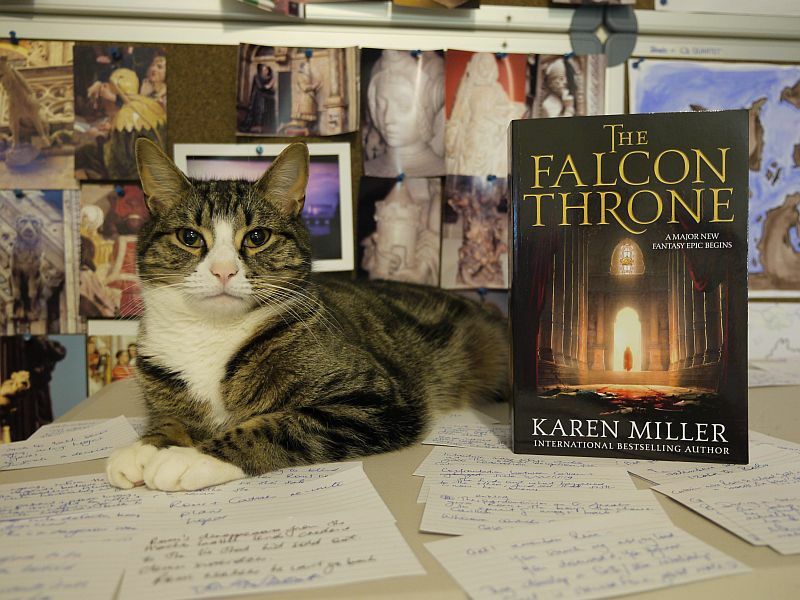 The Falcon Throne is a proper book! So, my good friend and fellow spec fic author Glenda Larke has led a truly amazing life. The places she’s lived, the things she’s seen and done — unique. Recently she went on the road to explore some of Western Australia’s remote top end, and now shares it with us in photos and commentary on her blog. I’ve never been to this part of Australia and hopefully will rectify the omission before I kick the bucket. In the meantime, I will marvel vicariously, thanks to Glenda. Why don’t you go visit her blog and marvel vicariously along with me? And if you’ve not yet had the pleasure, investigate which one of her books you’d like to read first! Like pretty much everyone who goes there, I fell instantly and forever in love with Venice. My visit was too short and one day I will go back. Venice’s carnivale masks are famous worldwide, and for good reason. Here is the merest hint of their glorious diversity and creativity. Just so puppy noses aren’t put out of joint, I thought I’d introduce you to Wilson. A few years ago, after a long long time with 3 dogs, I lost Baxter (19) and Clancy (17) which left me with my super special McDuff. Yet another rescue job (we met at Mt Druitt TAFE, when I was teaching there), Duff, the Duffer, Dufflepod, Duffarooni, brightened my life and the life of everyone who met him. A black and hairy mutt, he was the most loving and gentle soul. By a miracle, and largely thanks to my wonderful vet Bruce, Duff survived a spinal stroke and, like Baxter, lived to the ripe old age of 19.